China could become the largest non-EU contributor to the so-called “Juncker Plan”, the European Commission President’s flagship investment initiative to revive growth in Europe. European Commission sources told EURACTIV that Beijing could invest between five and ten billion euros in the European Fund for Strategic Investments, the EU’s guarantee scheme to back risky projects in the EU. Jyrki Katainen, the Commission’s Vice-President in charge of the dossier, visited China on 29 September to discuss investment opportunities with Chinese Prime Minister Li Keqiang, and other members of his cabinet. EU officials and Chinese authorities are examining what instruments could be used to channel the investment. The European Investment Bank has set up a working group to explore areas and opportunities for co-financing and participation from the Chinese side, as well as how further to enhance the exchange of best practices. The group will include experts from China’s Silk Road Fund, the Commission, and the EIB. To date, nine member states have announced that they will co-finance projects by using the new guarantee scheme, a € 21 billion cushion supported by the EU budget to absorb potential loss in the projects. In July, the United Kingdom became the last country to join after Germany, Spain, France, Italy, Luxembourg, Poland, Slovakia and Bulgaria. London will contribute, with 8.5 billion euros, the largest sum to date. China’s investment in the bloc has sparked controversy in the past. In Greece, COSCO was blamed for paying a fraction of European salaries, and for not respecting European rights, according to the longshoreman’s union. Elsewhere, Chinese labourers have been brought in to work on massive infrastructure projects, putting into question whether its involvement would create additional jobs for Europeans, as the investment plan aims to do. The UK obtained financial support from China to construct a nuclear plant in Hinkley. In return for a £2 billion loan guarantee, the United Kingdom will allow Chinese companies to build an additional nuclear plant in Bradwell, Essex. The GMB union, which represents nuclear workers, said linking that deal to a reactor at Bradwell would be a “betrayal” of British workers. Brian Strutton, GMB National Secretary for Energy, said that “Chinese nuclear technology is unproven, and no UK government should even consider allowing it to be used in a new nuclear power station 60 miles from London,” the Guardian reported on 21 September. Asked if China would truly support job creation in the EU, Katainen said that he did not see “many Chinese workers in Europe” involved in the kind of projects EFSI intends to support. 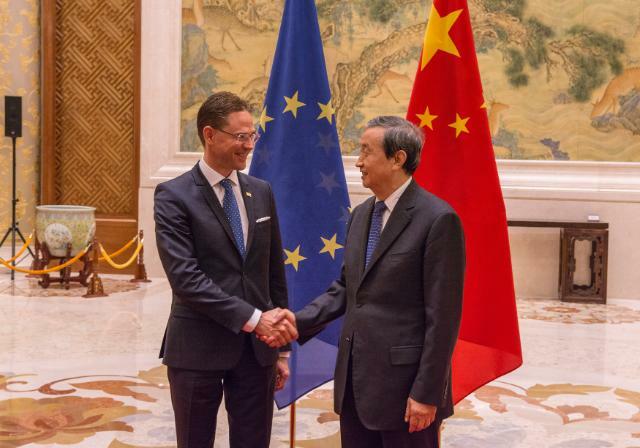 Katainen added that there will not be “special treatment” for China, as its companies will have to respect the EU’s labour and environmental rules. “There is no need for any additional labour force clauses,” he added. Fraser Cameron, Director of the EU-Asia centre in Brussels, said that China’s contribution to the new investment fund represents a “win-win situation” for both partners. He added that while Beijing wants to bolster its soft power in Europe, and gain European support on issues such as the reform of the IMF and the World Bank, China is also looking for large-scale projects to invest in that represent good business opportunities, in particular, high-speed trains and nuclear power plants. The plan has three objectives: removing obstacles to investment by deepening the single market, providing visibility and technical assistance to investment projects, and making smarter use of new and existing financial resources. According to European Commission estimates, the investment plan has the potential to add at least €330 to €410 billion to the EU's GDP and create 1 to 1.3 million new jobs over the coming years.